Dental Veneers. Z Dental Group - Beverly Hills Dentist, Los Angeles Dentist. 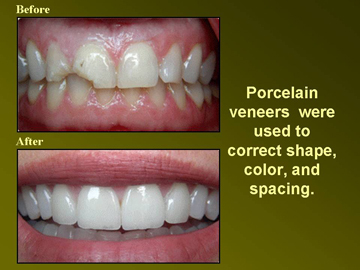 Porcelain Dental Veneers are an excellent cosmetic solution for a variety of dental conditions that affect the appearance of the front teeth. Durable and color-stable veneers are the perfect way to restore the natural function and beauty of your teeth so you can smile with confidence! If you are ready to instantly straighten crooked teeth, restore chipped or broken teeth and have a dazzling white smile, then you are an excellent candidate for Smile Design by Z Dental Group. A Smile Design combines art and science with the use of specialized custom porcelain veneers to create the perfect smile. Scheduling a consultation with the Z Dental Group Dentist is the first step to achieve the perfect smile you have always dreamed of. Z Dental Group's smile design process is streamlined to make your experience effortless and easy. The process can be completed in as little as two visits and requires little to no down time. Before creating your customized Smile Design, our Dentist meets with you to determine your smile goals. He involves you in every step of the process. When crafting your ideal smile, he considers your face shape, coloring, bite, gum health, and many other factors that will keep your veneers looking brilliant, natural and healthy for years to come. When your smile is disfigured by decay, abrasion, chipping, breakage or imperfect development, our goal is to restore its natural beauty, so you can smile with confidence. At one time, resin fillings or crowns were the only available treatment for the above types of conditions. 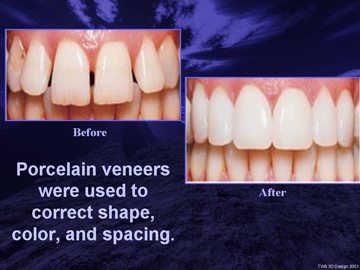 Today, veneers are the preferred alternative that has proven results! 1. Only a small amount of natural tooth structure (if any) is removed during the procedure. 2. A healthy, natural look is achieved with little or no discomfort. 3. Veneers are often less expensive than alternative procedures. 4. Veneers are strong, durable and color stable.